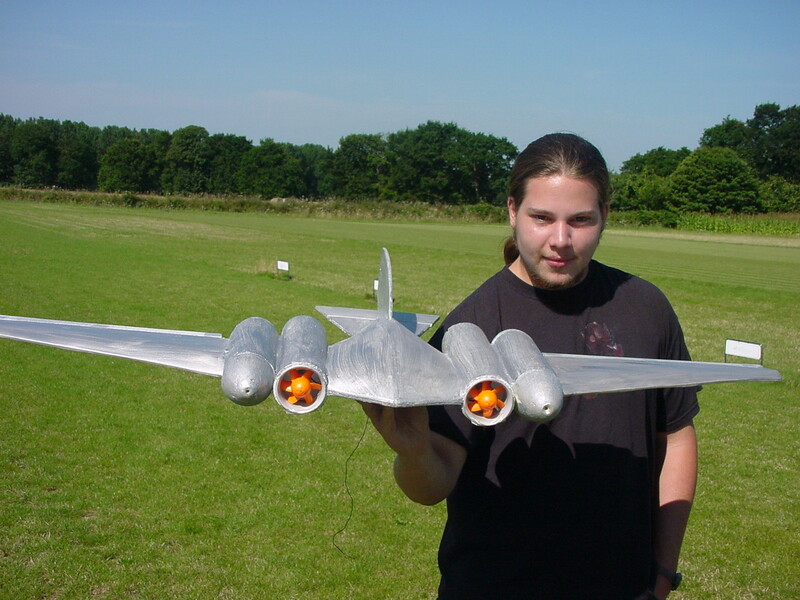 This is a semi-accurate 1/76th scale flying rendition of Senator Amidala's Naboo Royal Cruiser from Star Wars. It's the nice shiny ship that blows up as soon as it lands on Coruscant at the beginning of Episode II: Attack of the Clones. 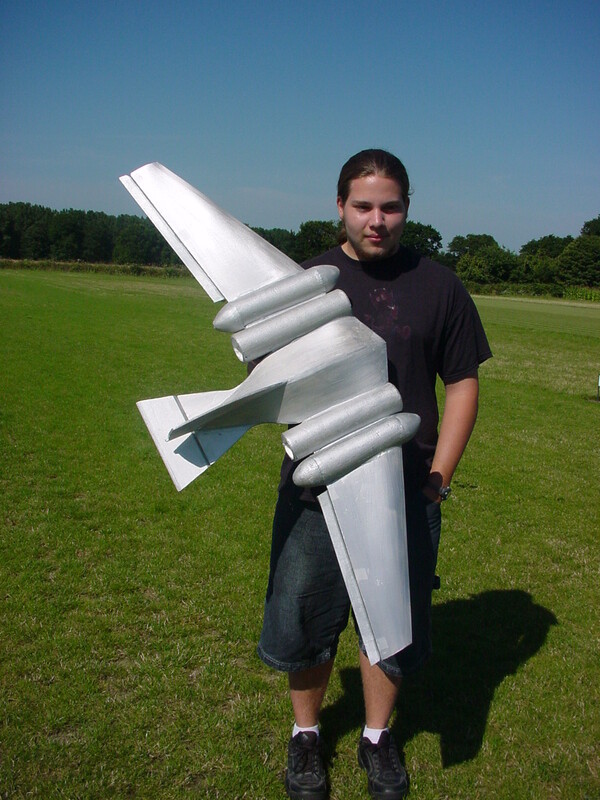 One rainy day of July 2004, Bertrand was holding two EDF-55 ducted fans in his hands, asking: "what could we build around these that would look cool". Kevin immediately replied "a Naboo Cruiser", to which Yann answered, "Yeah, we could make that fly". The next minute, they were on the web looking for good pictures, and the minute after that, they were folding Depron and rolling up styrofoam sheets around the ducted fans. We all know what happens when the sheet hits the fan (haha!). 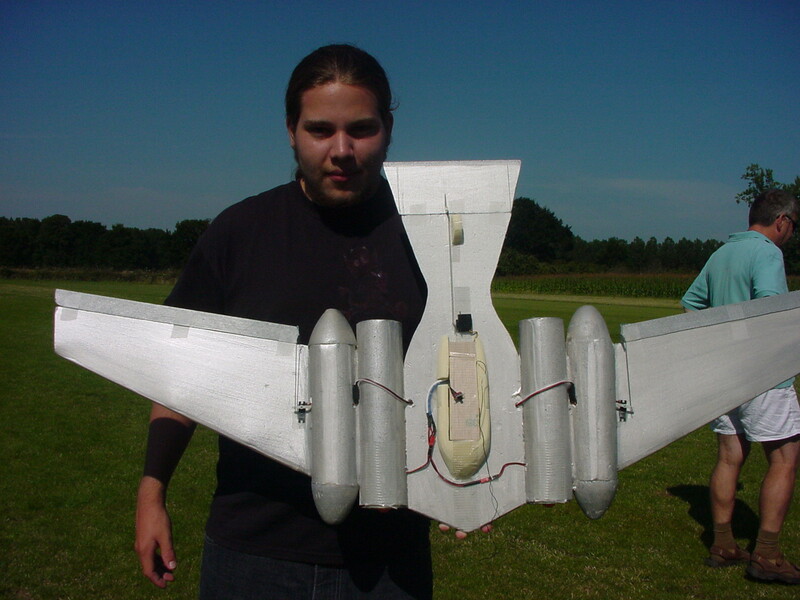 design/construction: Kevin, Bertrand, and Yann LeCun, July 2004.
wingspan: 128mm (the wingspan of the original starship is allegedly 91 meters, hence the scale is approximately 1/76th). motor: Two GWS EDF-55 electric ducted fans (they come with 300-size motors). battery: 3-cell 1300mAh I-RATE Lithium-Polymer. radio: GWS receiver with 3 GWS Pico servos. outer wings: 3mm Depron sheet folded over 3 ribs. Clark-Y-type airfoil. A single spar (6mm carbon tube) crosses the whole plane from the second rib of the left outer wing section to the second rib of the right outer wing section. fuselage: 6mm Depron for the bottom, 6mm Depron for the fin, 3mm Depron for the upper surface. turbines: rolled-up styrofoam sheet (not Depron). The front and back cowlings of the "fake" turbines pieces of yellow foam (polyurethane) shaped on on a wood lathe. The bottom section has been modified since the picture on the right was taken. The battery was moved all the way forward to correct the position of the center of gravity, and a lot of the "guts" and wires were put inside the fuselage. The wings and main body are built with 3mm Depron folded over a few ribs and a single 6mm carbon tube as a spar. The turbines are made of rolled-up polystyrene sheet (not Depron). The turbines' front and back cones are made of polyurethane foam (yellow foam) cut on a wood lathe. The plane was (quickly) painted with silver acrylic paint. flight: This plane looks terrific in the air. It flies very well too. The flight is gentle, but the power is more than sufficient for relatively high speed and very steep climbs. The current consumption at full throttle is about 14 Amps (7 Amps per fan), which is quite a bit above the recommended maximum for the EDF-55 motors. Therefore, we do not fly at full throttle for more than a minute at a time.